Writing: Fuller en Mexico / Fuller in Mexico. Awarded a Graham Foundation Grant for Individuals, Daniel López-Pérez is the editor of Fuller in Mexico! The Architectural Alternative (Arquine, CONACULTA, 2015), a study of R. Buckminster Fuller’s “World Design Science Decade”. Commemorating the 120th anniversary of R. Buckminster Fuller's birth (1895‐1983), Fuller in Mexico! 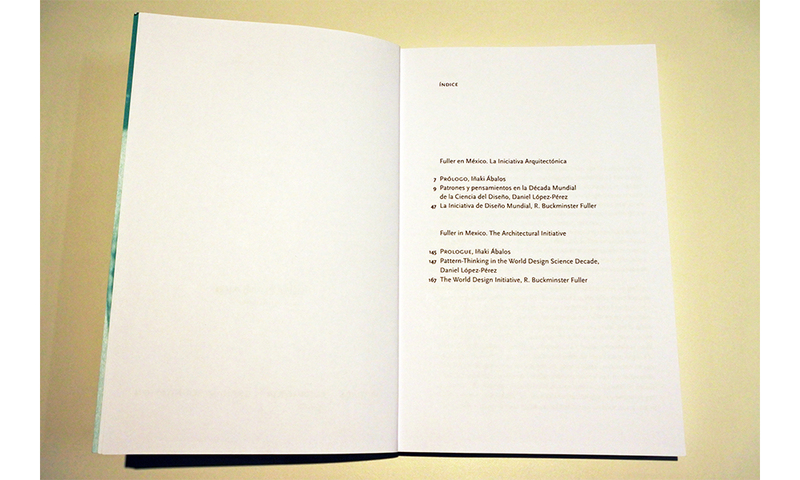 The Architectural Alternative publishes the "Mexico Lecture" in full, both in English and Spanish, illustrated with its original slides and captions. The "Mexico Lecture" is one of the most comprehensive and concise autobiographical overviews of Fuller's career, outlining the basis for what would become a more overtly political discourse that would dominate his later years. The lecture also launches the "World Design Science Decade (1965-1975)", an ambitious ten year program for architectural education to be adopted by programs globally. Although Fuller had demonstrated a lifelong commitment to general education, the "Mexico Lecture" and "World Design Science Decade" focused specifically on architectural education and its broader role in society ‐ an extraordinary moment from which to reflect upon our contemporary condition and search for ways to expand the discipline's collective and civic project in unprecedented ways.